U of MN students protest Kavanaugh and sexual violence | Fight Back! Erin Murphy, speaking at U of MN SDS rally. Minneapolis, MN - On October 4, youth and community members across the country participated in a national day of action to protest Supreme Court nominee Brett Kavanaugh, and to support survivors of sexual violence. 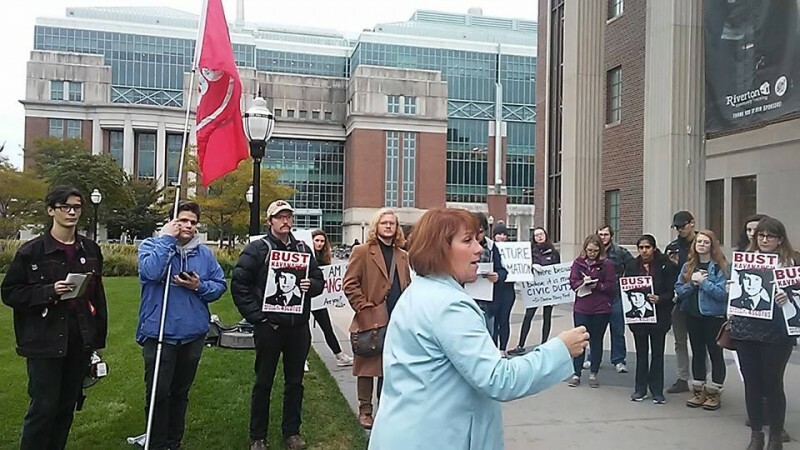 Organized by Students for a Democratic Society (SDS), more than 50 people gathered at the University of Minnesota's Coffman Memorial Union, while more than 3000 people gathered in Washington D.C. and scores of cities across the country, to protest Kavanaugh's nomination to the U.S. Supreme Court. While Republicans in the U.S. Senate appear to want to push through the appointment of Brett Kavanaugh, students and community members rallied to demonstrate the illegitimacy of a process that fails to grapple with credible accusations of sexual assault and to stand with survivors of sexual violence. Speakers from Students for a Democratic Society (SDS), the Anti-War Committee (AWC), and Black Lives Matter - Saint Paul spoke alongside Erin Murphy, a progressive gubernatorial hopeful in Minnesota's DFL primary race and politician who has consistently championed 'affirmative consent' laws in the state and on campuses. Attendees were appalled that Kavanaugh is being pushed through the confirmation process with so little attention to his problematic history - which involves his participation in a much maligned fraternity at Yale - a fraternity which was also sanctioned at the U of MN as a result of a sexual assault in 2010 - and the fact that Kavanaugh represents a stark, reactionary agenda.